It somewhat feels too soon for jumpers already but with the cold setting in quite quickly and all this rain, I'm ready for jumpers and really bright ones too. 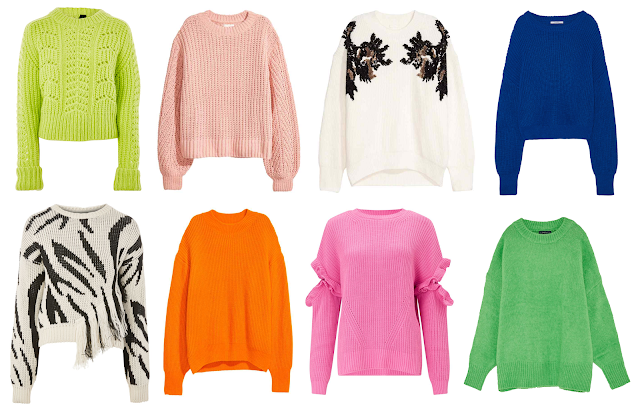 I love jumpers and even more so when they're exciting colours and styles. I've been internet window shopping (again) and found some great ones I'd love to show you. Let's start off with how awesome these colours are, right!? I mean we've got emerald green, the brightest orange ever and shades of pink I can't get over. I love the colours we have right now. It's completely me. I was initially inspired by the bright reds in Primark a couple of weeks ago and now I want a jumper in every colour. Then you might never worry about not having a jumper in a colour to go with an outfit! As well as bright and bold colours, I love the monochromes we have at the moment too, especially these two I've added on today's wishlist. I spotted the top one in H&M's window the other day so I know I definitely love it and I might have to find the zebra one somewhere because it's simply amazing. They'd both go with a lot and make a huge statement. The best thing about jumpers though apart from their chunky layering abilities and amazing colours and textures and styles, is the cosiness they bring. They make winter just that little bit better which is why I've already been wearing all mine this week. I love a jumper, don't you? Great wishlist, loving the bubblegum colour!